Role – Volunteers, in pairs, visit with our neighbours in need, usually in their homes, to assess the need, providing emergency assistance in the form of grocery gift cards &/or vouchers for non-perishable food, clothing, household items or furniture, to be redeemed at the Store. 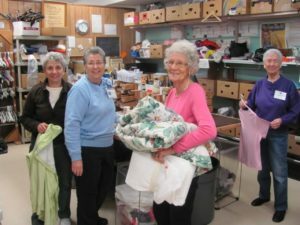 Role-Volunteers at the Store receive donations, sort them and prepare them for distribution (free) to our neighbours in need or sale (at modest prices) to raise funds to support our work. Role-Students who have completed at least Gr. 8 work alongside Store volunteers.